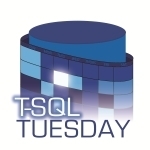 Posted on April 9, 2013, in Personal Development Plan, SQL Saturday, Training and tagged #tsql2sday, SQL Saturday, T-SQL Tuesday. Bookmark the permalink. 2 Comments.